Despite the fact that I’ve never owned a car, and I drive only a couple of times a year, I’ve always had a fascination with car design. When I was a kid, I knew all the marques. I would sit in the back seat of my parents’ van, naming the cars that went by, a copy of the Consumer Reports car guide on my lap. 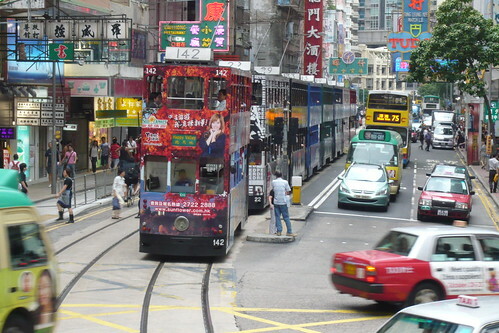 Even today, when I’m stuck on traffic on the bus here in Hong Kong, I’ll gaze out and catalogue my fellow travellers: the bulbous Nissan Marchs, hulking Toyota Alphards, the endless varieties of 3-Series BMWs and C-Class Mercedes that are so common in Hong Kong. 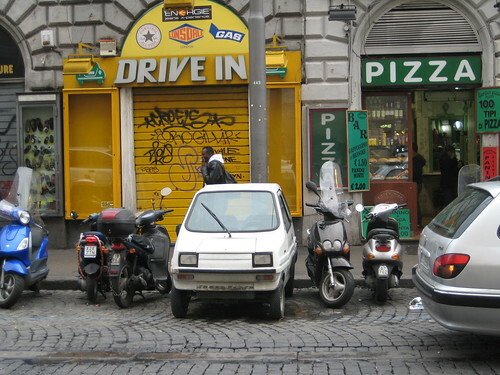 Of course, my interest isn’t limited to private automobiles. When I visited other North American cities with my family, I noted with interest how New Flyer buses were common in the west, Novabuses in the east. I learned to appreciate the classic New Look buses that served as workhorses on so many Calgary Transit routes, retro-stylish even as they struggled up the long hill to my house, ancient engines moaning in protest. I bring this up because of Thomas Heatherwick, who delivered a very animated and entertaining talk last weekend at the Business of Design Week forum in Hong Kong. Heatherwick is a British designer whose London-based studio has produced, among other things, the “Seed Cathedral” at the 2010 Shanghai Expo and the spectacular cauldron of the 2012 Olympic Games. 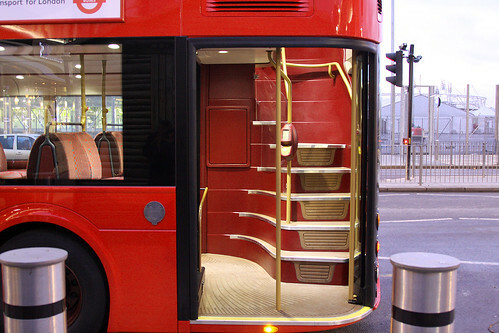 Heatherwick is also the designer of the New Bus for London, which he highlighted in his talk at BODW. When the bus was unveiled last year, there was some sense that it was at best a vanity project, at worst an attempt to indulge nostalgia, since the new bus was meant as a revival of the iconic Routemaster bus, which was produced until 1968, retired from regular service in 2005 and known for its hop-on, hop-off open back end. The typically rancorous peanut gallery at Dezeen blasted Heatherwick’s design as “steampunky art nouveau” and a “glorified student project” that put “fashion over function.” One cranky commenter insisted that “the bus should be practical above all else,” as if Heatherwick had produced a three-wheeled jitney that ran on the distilled essence of gold. The public was less critical. 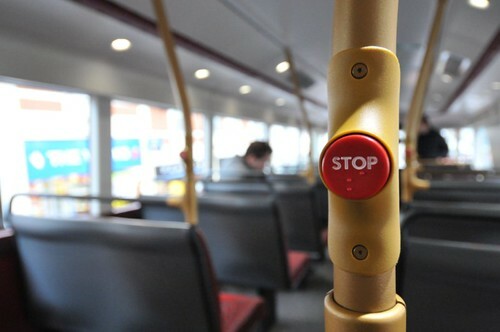 The new bus has proved popular, and after a successful trial run this year, 600 models will be ordered for service. Heatherwick offered a very convincing explanation of his design at BODW. Rather than a pointless throwback, the curves are meant to reduce the bulk of the new bus, which is nearly three metres longer than the old Routemaster. The windows follow passenger flow through the bus. Soft spot lighting replaces fluorescent tubes and plastic bucket seats are replaced by cushioned benches. Alongside the open back door, which was part of the design brief, those benches are perhaps the most obvious throwback to the Routemaster. “There were successful things from the older [designs] that we reintroduced,” Heatherwick told Architectural Digest earlier this year. “The calmness of the bench seats, for instance. 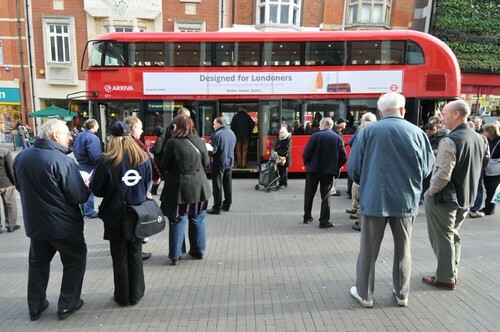 That was a good idea — why did we throw it away?” He called the current state of London’s buses “experiential mayhem,” and the new bus is meant to restore passenger comfort. “My work always comes down to the human scale,” he said. Beyond his headline-grabbing turns a the Shanghai Expo and London Olympics, Heatherwick is known for taking on unglamorous projects like power stations and parking lots. The bus is not so different. Despite the changes in ridership, passenger behaviour and technology over the past 50 years, no one has bothered to rethink the bus from the ground up. Modern-day buses are a mishmash of regulatory requirements and revenue-generating advertising platforms; the fact that they are places where people spend hours each day seems almost incidental. In effect, buses and their vehicular kin are mobile architecture — and they contribute much more to the vernacular of a city than any single building. Heatherwick lamented the aesthetic globalization that seems to have taken hold in the world’s major cities; think about the maddeningly dull Nissan NV200, which will become the standard taxi vehicle in both London and New York. 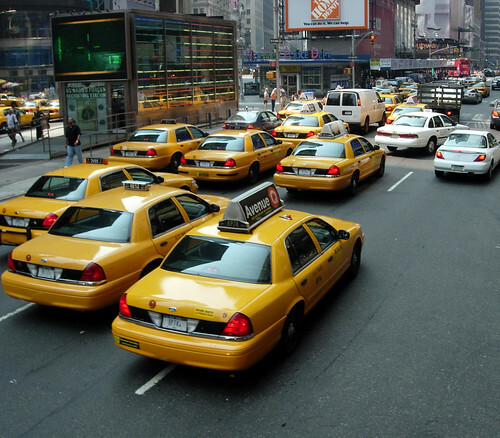 This might not seem like a big deal, but it affects one’s experience of the city on a surprisingly deep emotional level. When Hong Kong’s last un-air-conditioned “hot dog buses” were pulled from service earlier this year, hundreds of people lined up for one last ride, leaning out the windows and shouting to passersby as the buses trundled through Mongkok. It doesn’t take a Thomas Heatherwick to appreciate the visual and cultural significance of Routemaster buses or Ambassador cabs. What is exceedingly difficult is getting policymakers to understand the significance of unique design for things like buses. After Heatherwick’s presentation, a woman in the audience pointed out that Hong Kong’s bus fleet is about as user-unfriendly as it can get: cramped seats, harsh lighting and constant television advertising booming through interior speakers. 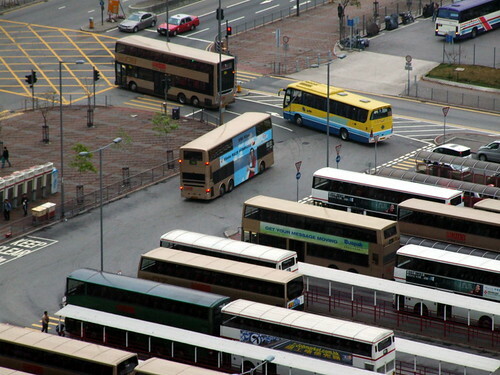 How can Hong Kong get the ball rolling on a new bus of its own? Heatherwick was stumped. So am I. But it’s worth fighting for. This entry was written by Christopher DeWolf , posted on Wednesday December 12 2012at 11:12 pm , filed under Architecture, Art and Design, Asia Pacific, Europe, Public Space, Society and Culture, Transportation and tagged Buses, Design, London, Taxis . Bookmark the permalink . Post a comment below or leave a trackback: Trackback URL. 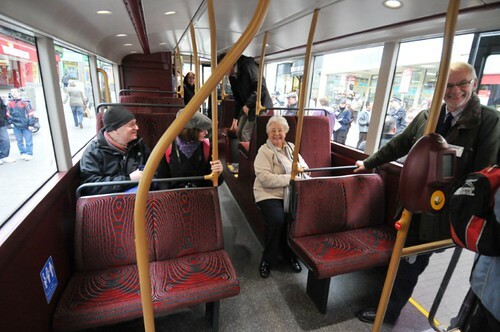 I think when you look at the public response to Heatherwick’s new bus design, you have to note that the background for it is years of quite heated debate about the style of buses most suited to the city. There was the introduction of the “bendy buses” – articulated double length vehicles which divided opinion (loathed by cyclists, including Bojo, but loved by people with pushchairs, wheelchairs etc..) These also drew some economic arguments – supposedly making it easier for fare dodgers. Then the government aborted this project and returned to the double deckers, a move that again drew both applause and criticism. Heatherwick was quite brave to be willing to enter into this discussion and produce a new model. For his design to be well received by even some people might be seen as a success. He is something of the darling child of British design at the moment though for his curling bridge. Can you tell me when you sought my approval to use one of my photographs given that all rights are reserved as shown on Flickr? The photo was used with the “share” function on its Flickr page. If you’d like the photo to be removed, I would be happy to do so, but I suggest you adjust your Flickr settings so that your photos can no longer be shared by other users. Hi Christopher, may I have your permission to post your your NGD Alley photo on my website? The laneway reminds me of walking out onto a brighter way of life. Simple yet such an impactful picture for me as a life coach who grew up in Downtown Toronto’s Cabbagetown where laneways were my shortcut home all of the time growing up. Great work!!!!!! !